If you don’t find any food you like, please ask our member of staff, we will do our best to provide you the dish you like. Please speak to a member of staff before ordering, if you are concerned about the presence of allergens in any dish or you have any questions relating to any ingredients used. Please be aware that all our dishes are prepared in a kitchen where allergens are present, therefore we cannot guarantee that any dish is completely free from traces of allergens. Ring of onion, potato & spinach leaves, battered with gram flour flavoured with green chillies, turmeric, garlic & ajwain… deep fried & served with mint & tamarind chutney. Pastry parcels freshly made, filled with seasonal vegetables deep fried. Steamed dumplings served with homemade chutney. Fresh cottage cheese marinated in the batter of yoghurt, ginger garlic and exotic spices with onion seeds and skewered in earthen oven. Marinated paneer tawa sizzled with onion, green pepper and special homemade chilli sauce. Onion slices marinated in gram flour and spicy masala sauce and deep fried. Potato cubes cooked with homemade spice, herbs and Diwali’s own tangy sauce. An assortment of vegetarian starters giving you a taste of our best starters please ask your server for details. Tender pieces of breast chicken or lamb cubes marinated in fine spices and roasted in the tandoori oven. Creamy kebab of boneless chicken blended with cream, cashew nut paste, lemon juice, cardamom and green coriander, grilled in clay oven. Tender rolls of lamb, minced, mixed with chopped ginger-garlic, green chillies & coriander, spiced with cumin & saffron, skewered and grilled over charcoal oven. Prawn cooked with chat masala and served on the bed of fluffy bread. Freshly battered chicken breast, deep pan fried in oriental style. Small chicken cubes cooked with special chat masala , herbs and tangy sauce. Steamed dumplings served with home made chutney. Whole chicken, marinated in a mixture of yoghurt, vinegar, ginger-garlic paste, lemon juice, red chillies, & garam masala…skewered and cooked in the Tandoori…served sprinkled with chat masala. Pastry parcels freshly made filled with minced chicken or lamb and deep fried in the vegetable oil. Jumbo prawns marinated with yoghurt, flavoured with ajwain, red chillies, turmeric & garam masala. Skewered and grilled in clay oven. Exotic “Ajwain” flavoured coley fish, battered with mildly spiced ginger garlic paste & turmeric powder, red chilli powder and deep fried, garnished with lemon and chat masala. Combination of kebabs, chicken tikka, malai tikka, lamb tikka and king prawn served with green salad. Selection of tiger prawn, chicken tikka, lamb tikka, sheek kebab and tandoori chicken served with green salad and plain naan. Tender pieces of breast chicken marinated in fine spices and roasted in the tandoori oven. Chunks from the lamb, marinated in the mixture of yoghurt and vinegar with melange of spices and char-grilled over red hot amber. Whole chicken, marinated in a mixture of yoghurt, vinegar, ginger-garlic paste, lemon juice, red chillies, & garam masala…skewered and cooked in the Tandoori…served sprinkled with chat masala. Jumbo prawns marinated with yoghurt, flavoured with ajwain, red chillies, turmeric & garam masala. Skewered and roasted over char-coal, served with lemon slices. Diced pieces of chicken or lamb marinated in fine spices with capsicum, onion and tomatoes and cooked in the tandoori oven. Exotic “Ajwain” flavoured fish, battered with mildly spiced ginger garlic paste & turmeric powder, red chilli powder and deep fried, garnished with lemon and chat masala. Creamy pieces of chicken cooked with coriander and ginger-chops. A delicacy from the South India, prepared with chunks of chicken in a blend of spices and tomatoes gravy tempered with curry leaves and red chillies. Tandoori chicken cooked with fresh tomato, cream, butter, cashew nuts and ginger -garlic paste. Creamy chicken tikka cooked with fried black pepper in the curry sauce. Chunks of lamb with lamb mince mixed with ginger-garlic, green chillies, cinnamon, cumin, coriander and braised in marinade. Minced lamb cooked with onion tomato and green peas infused with garlic and ginger. Chicken cooked with fried garlic, thick and spicy. Best pieces of chicken cooked with fenugreek leaves. Cooked with mango achar and spices in a thick sauce garnished with fresh coriander and medium spicy served in a karahi. 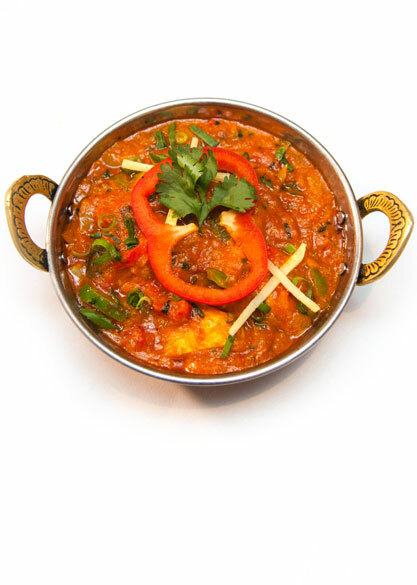 Chargrilled fish cubes cooked in the medium indian style sauce based on onion, tomato and coriander. Tilapiya Fish cooked with onion, fresh tomato and ginger-garlic chops in spicy sauce. Home made soft cheese, cooked in tomato sauce and finished with crushed Coriander seed, black pepper and chopped capsicum. Home made soft cheese cooked with fresh tomatoes, cream, butter, cashewnuts and ginger-garlic paste. Fresh chicken cooked with chef’s special sauce with fried garlic. Slow cooked Lamb on its own juices with aromatic medium spicy caramelised onion, ginger and finished with spring onion. Selection of chicken, lamb and prawn Grilled in clay oven and cooked in chef’s own style served in medium sauce. Cooked in tomato sauce with capsicum, onion and fried garlic. Cooked in chef’s sepicial sauce with very hot chilli paste. Dry and mouth watering. Cooked in cashew nut gravy and garnished with cream. Cooked in a spinach gravy lightly flavoured with garlic. Cooked in mildly spiced curry sauce. Cooked in spicy, hot and sour curry sauce. Cooked with a piece of potato in the very hot sauce. Spiced in onion and tomatoes gravy. Cooked with lentils - hot sweet and sour. Creating a tangy flavouer and more tomatoee. Cooked in a thick and dry sauce. Popular Indian Dish prepared with mustard seeds and special herbs. A “Royal dish” little bit spicy but not hot, rich and creamy with nuts and almond flakes. Cooked in tomato sauce and finished with crushed coriander seed, black pepper and chopped capsicum. Chicken kebab chunks cooked in an extremely flavourful chop masala. Chicken cooked with onions green peppers, chilli and spicy sauce. Basmati rice seasoned chicken, vegetable and cashew nuts in special earthenware, cooked over slow fire to retain its aroma & flavour served with biriyani sauce. Basmati rice seasoned lamb, vegetable and cashew nuts in special earthenware, cooked over slow fire to retain its aroma & flavour served with biriyani sauce. Basmati rice seasoned king prawn, vegetable and cashew nuts in special earthenware, cooked over slow fire to retain its aroma & flavour served with biriyani sauce. Basmati rice with seasoned vegetable, and cashew nuts cooked in special earthenware, over slow fire to retain its aroma & flavour. Basmati rice with seasoned chicken, vegetable, lamb, and cashew nuts cooked in special earthenware, over slow fire to retain its aroma & flavour. (Chef’s Special Lentil) Combination of black lentils, ginger-garlic paste, simmered overnight over slow fire, garnished with cream & dollops of homemade butter. Fresh yogurt prepared with cucumber, hints of salt.